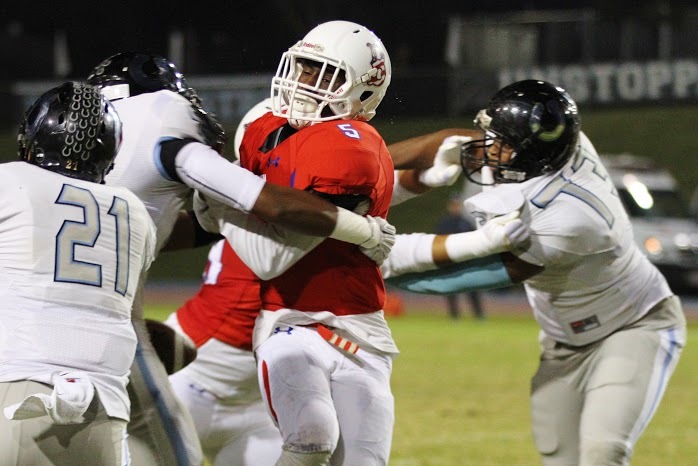 The Buchanan Bears held on to beat Clovis North 31-28 on Friday, Nov. 6, at Veterans Memorial Stadium, to win a share of their first Tri-River Athletic Conference title since 2009. In nail biter that was competitive all the way through, both teams made plays in key situations but the Bears delivered the final blow. Buchanan running back Chuby Dunu works for extra yards while trying to be dragged down by a host of Broncos in the Bears 31-28 victory over the Broncos. The Bears (7-3, 4-1) grasped their largest lead of the game at 24-14 early in the fourth quarter when sophomore running back Trevor Ervin busted loose for a 49-yard touchdown run. But the Broncos (5-4, 3-2) answered with an 11-yard touchdown pass from quarterback Jeremy Miller to receiver Andrew Tockey to cut the lead to three. But on the ensuing kickoff, returner Braylen Williams took one back to the house to push the lead back up to 10 with 7:18 left in the game. The senior caught the kick at his own 8-yard line, made numerous defenders miss, utilized key blocks, eventually saw daylight and took off down the Buchanan sideline for a 92-yard touchdown. The teams exchanged a pair of rushing touchdowns in a back-and-forth first half to tie the game up at 14 each heading into the locker room. But Buchanan relied on its run game to get the job done offensively and Ervin finished a game-high 165 yards rushing on 18 carries and a touchdown.